These space-saving, mobile Wilkhahn folding meeting tables can accommodate up to ten people. They can then be folded up in no time at all and moved out of the way! No tools required to either set up or fold up these tables! Easy! 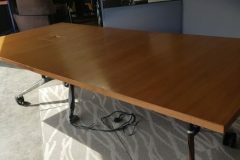 We have 6 of these tables available – 3 with wire management cut outs. 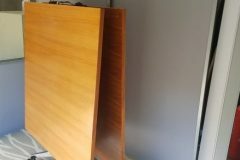 If you are interested in buying these tables, please contact one of our sales team on 07944 508282, or click on the Telephone Icon located at the bottom of this page.